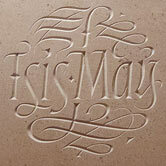 Hand Carved Memorial plaques, Commemorative Plaques, Opening Plaques - in Slate, Stone, Limestone, Sandstone and Marble. 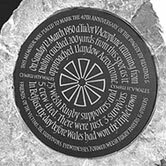 Plaques can be hand carved from Welsh Slate, Westmoreland Green Slate, Limestone, Sandstone, Marble and other stone, all of which have their own characteristics. Which would be the most appropriate depends on size and style of letters, imagery (if applicable), location and surroundings, and if outdoors its position in relation to the sun. The letters can be deeply cut with a ‘ V ’ cut incision, flat based or in relief. 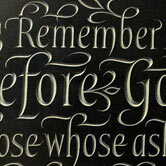 For added legibility the letters can be painted in a sympathetic colour. 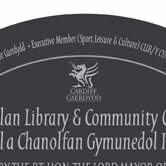 Commemorative Plaques & Memorial Plaques on a solid wall are fixed with two concealed stainless steel rods of the appropriate thickness and angled downwards into the wall and the holes in the back of the plaque are drilled upwards so that the plaque is in effect hooked on. The advantage of this method, which I have used successfully for over 40 years, is that the weight of the plaque wedges tight against the rods (fulcrum priciple applies) so it can’t fall off. Another advantage is that no unsightly screws are visible. Stone resin can be applied if necessary. Fixing on to a partition wall is a bit more costly as I will need to visit the site to inspect the partition or I would need to be supplied with technical drawings showing the wall construction and the materials used.